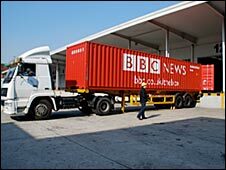 BBC News is following a container around the world for a year to tell stories of globalisation and the world economy. Yuyao, part of Ningbo, a city about three hours by road from Shanghai, is home to some 20 factories that make metal measuring tapes, the sort that you use for DIY at home, according to the production manager of one of them, Jiang Bo. With so many competitors it is always going to be difficult to make your business profitable, but in the current climate it is harder than ever. Mr Jiang says one in three workers at his plant has left in the last few weeks. Some left after wages were cut. Others were let go. The problem has been that customers, mainly from overseas, have started to cancel orders as they have seen business dry up in their stores in the United States, Europe, Japan and elsewhere. "Our orders have been dropping, we're down to between 70 and 80% of what we had before," he says. "Everyone is suffering in this financial crisis." On the first floor of the factory where the tape measures are assembled lines of workers, most of them between the ages of 20 and 35 are hunched over benches, working fast, barely noticing as the manager walks by checking their work. There are some lines though that lie empty. That's not unusual. 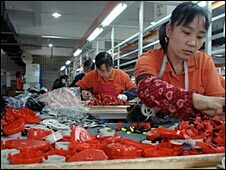 The latest economic data from China suggests growth in industrial output has slumped to its lowest level since 2001. Hu Lai Xi is a 21-year-old migrant worker who came to work at the factory from Hubei province. He sits at his bench piecing together the mechanism for the tape measures by hand. It's repetitive work. 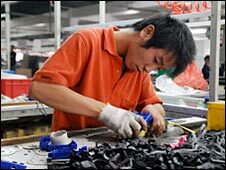 The production manager explains that they organise it so that workers assemble different products on different days so they don't get too bored. Hu Lai Xi says he has heard about the global economic crisis. He knows the workforce at the factory has shrunk by 400 so far as a result of the fall off in orders and he worries about what will happen to him. "If I lose this job," he says, "it will be hard to find another one at the moment. There aren't many around and wages are low." Hu Lai Xi supports his two sisters with his wages, one of whom is still at school. Across China there is anecdotal evidence that millions of migrant workers like him are losing their jobs as their factories get into financial difficulties. That is a real concern for the Chinese leadership who are worried that increases in unemployment could lead to public unrest. China coped in the past when the large state-owned enterprises sacked millions of workers in an effort to become profitable. But China has changed a lot since then. The economic situation both in urban areas and in the countryside is quite different. In fact, the experience of past economic crises isn't much use right now. We are in uncharted waters. No one really knows what will happen. "I am confident about tomorrow," the production manager Jiang Bo insists, however. "Other countries still can't compete with us on price." Mr Jiang watches as the boxes of metal measuring tapes which are to be sent to the United States in the BBC Box, the container we're tracking around the world, are loaded onto a pallet, ready for transportation by road to Shanghai. This order is still going ahead. But the concern for him, and his workforce, is whether the cancelled orders over the last few weeks were, as he hopes, a one-off readjustment, or whether there will be more cancellations in the months to come. As trade with countries overseas begins to contract, the Chinese government is looking to the domestic market to try to fill some of the gap. But although China has a growing middle class, its consumer base is still small. People have more money to spend than they used to, but many are unwilling to buy products that would make their life better, because they fear for their future. China lacks adequate social insurance provision. That means that people save to make sure they have enough to tide them over in the event of ill health, or to ensure they have enough to live on in old age. 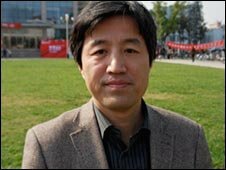 Professor Sun Lijian from Fudan University in Shanghai says the government can try to persuade the middle classes to spend more to boost the profits of Chinese companies. But he believes it won't work unless there are improvements to the social insurance system. "People want to spend, but we need to decrease uncertainty," he says. Over the long term he too is optimistic about the prospects for the Chinese economy. "In China, if we can solve the imbalances in the economic system, and expand our domestic market, increase investment in the countryside and improve the social situation in the cities, people will start spending and that will support our markets." At a large warehouse in Shanghai the BBC Box is being loaded with the cargo from the factory in Ningbo. It will travel from China to Los Angeles on the west coast of the United States, and from there by rail to Pennsylvania. There the goods will be distributed to a chain of homeware stores across the United States. The BBC container is dwarfed by huge towers of containers some of them 20 metres high. The stacks give you a sense of just how big the export business still is here, but it's slowing down nonetheless, and that is of concern to the workers doing the loading here, the truck drivers, the factory owners, and all the way back down the supply chain the migrant workers who assemble the goods for the world's consumers. All fear that the financial turmoil elsewhere is starting to affect them, and wonder what will happen next. Have you spotted the Box? Send your pictures and videos to yourpics@bbc.co.uk, text them to 61124 or if you have a large file you can upload here. Alternatively, members of photo-sharing website Flickr can add their picture of The Box to our dedicated Box group, from which the best images may be selected for inclusion on this website. Before adding pictures, please note how the group works, as detailed on its main page.